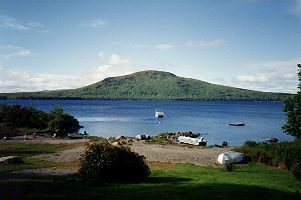 Discover Sally Mountain Cabins this year-rustic cabins on the shores of beautiful Big Wood Lake, located in the famous Jackman-Moose River Valley region. Jackman's 250,000 acres of natural wilderness is interlaced with hundreds of miles of logging roads and trails. This makes it easy to explore breathtaking mountains, lakes, ponds, streams and wildlife. Take a little walk into downtown Jackman (population 900) and you will find country stores, fine churches, excellent restaurants and cocktail lounges. Exciting Canada is only 16 miles away. 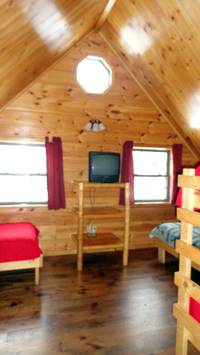 Sally Mountain Cabins can accommodate 2-5 peole in our smaller cabins and groups of 10 or more in our larger ones. 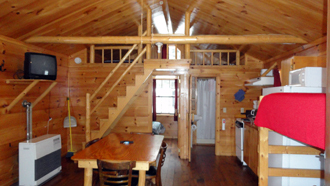 Your private cabin is equipped with oil heat, full kitchen, full bath, all linens, blankets, pillows, towels, cooking and eating utensils, color cable TV and much, much more. Your cabin is well maintained and thoroughly clean!